We love tea (you may have guessed that). We love the memories that tea-time creates. We have created our tea blends by hand, and with love, so that you may truly enjoy your next tea-time. Whether tea-time means a strong cuppa over breakfast, a morning tea break with a biscuit, tea and scones with the family on Sunday afternoons; or sitting in the sun alone, amongst the trees with a pot of tea and a cheese plate - we hear you. And we want to inspire and share the tea experience with you. Our teas are all hand blended by us in Melbourne in our little tea studio. We source our tea from all around the world, concentrating on those most famed for their unique qualities. We strive to bring you quality tea that is true to its taste and that inspires you to create some time in your day to breathe, sip and enjoy. As the humble tea bag is pushed aside, it makes way for sophisticated tea menus of high quality loose leaf tea, which have been prepared with care and served with finesse. 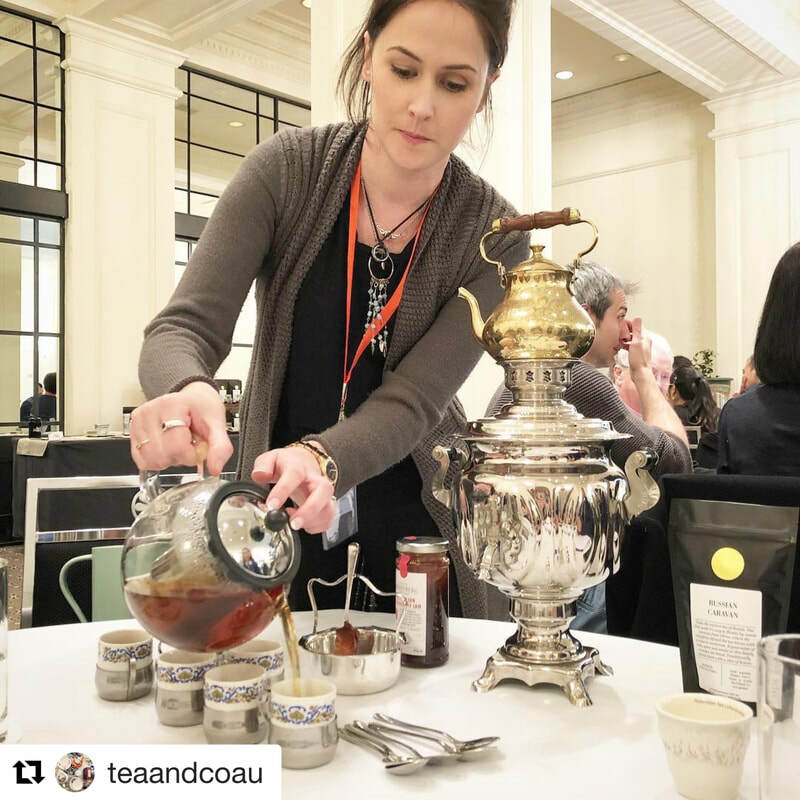 Beautiful teas are now showing up on beverage menus, providing servers with the opportunity to introduce guests to high quality and sometimes rare teas. With over a decade of experience in the hospitality industry, combined with our experience in hospitality education, we provide your venue with advice on delivering high quality tea service to your guests. Our hospitality services include custom tea blends, tea menu selection and advice; and staff training on tea preparation and service. We aim to support the awareness of tea and growth of the tea industry in Australia. We are members of AUSTCS (The Australian Tea Cultural Seminar). Kristy demonstrates traditional Turkish tea making. We are proud sponsors of the 2018 Tea Cosy Festival in Fish Creek.